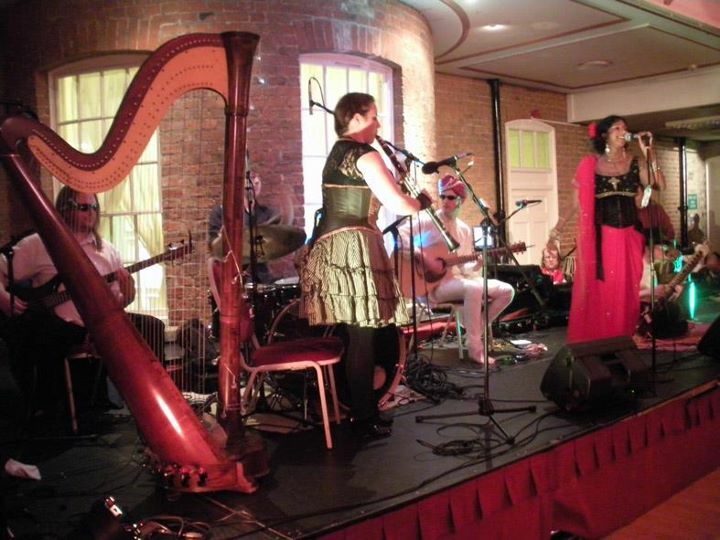 This was the third year that Sunday Driver were invited back to play at The Asylum, the UK’s largest “Steampunk Convivial” – regular readers may remember my dispatches from the 2009 and 2010 gigs. 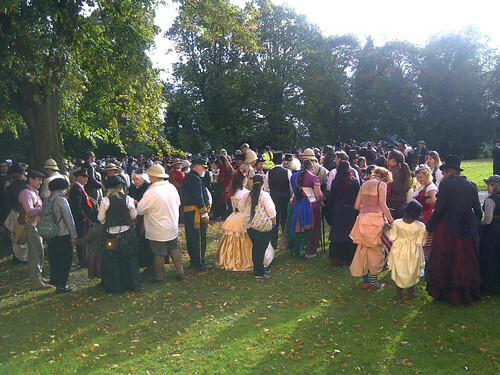 This year was the biggest gathering yet – in fact, the organisers were going for a World record attempt at the largest number of Steampunks in any one place. This picture doesn’t really capture the scale but there were a lot! Sadly I can barely remember a thing about this year’s event because I was struck down by an evil cold. I spent the day flopping about with a raging temperature whilst leaking a potent mix of snot and viruses out of my face. I have heard whispered rumours on Facebook of “Asylum lurgy”, and fear that I may in fact be Patient Zero in this case. I vaguely remember spending the afternoon manning the Sunday Driver listening station, forcing poor unsuspecting passers by to listen to our brand new album, The Mutiny, while plying them with free gin and homemade chocolate brownies. This turned out to be a remarkably successful sales tactic, only slightly spoiled by thinking we’d managed to lose the resulting cash (I discovered it 6 hours later down the back of a sofa). Because our tabla player Amit is still AWOL with a broken hand, we were honoured to be joined on stage for our gig by the legendary Kuljit Bhamra MBE – one of the finest Asian musicians working in Britain today. I was a little distracted by trying not to blow snot out of my nose at the same time as blowing down my clarinet (not my finest or most attractive hour, I admit) but it was an incredible experience to play with such a talented musician. Not much else to report, except that the next day I discovered that the only thing worse than waking up in Travelodge is waking up in a Travelodge with a stinking cold and knowing that you have to drive 120 miles home and then do a 4-hour recording session. FML. 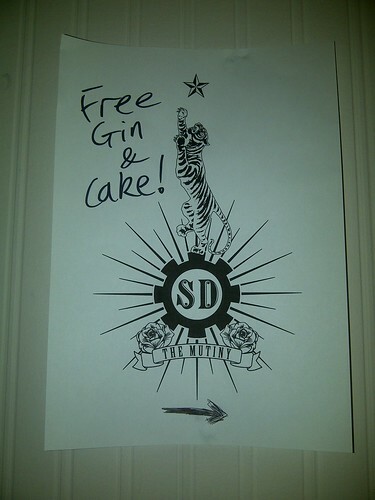 This entry was posted in Gigs, Music, Steampunk, Sunday Driver. Bookmark the permalink.